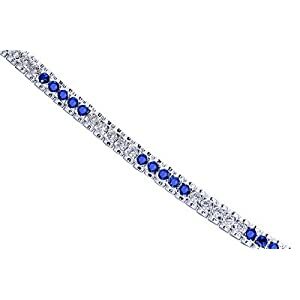 Round Cut Created Sapphire & White CZ Gemstone Tennis Bracelet in Sterling Silver Stones: Created Sapphire : 19 pieces, Round Cut 4.00mm White Cubic Zirconia: 20 pieces, Round Cut 4.00mm Gemstones have deep rich color and tremendous fire. Bracelet: 30.58 grams Pure Sterling Silver with .925 stamp 7 1/4 length, 3/8 width Approximate Retail Value: $249.99 Bracelet features one of akind design with a beautiful White Gold finish. 100% Money Back Guarantee. Includes a Signature Gift Box and FREE SHIPPING.